Gardening is a fruitful endeavor. There’s so much joy that comes from creating something from scratch. The journey from seed to sprout to tree to flower to harvest to plate – it’s a captivating marvel of nature. Instead, many of us spend our lives tapping the keys at an institutional desk bolted down to an urban concrete monolith. We dream of breaking the shackles, casting off the pressures of KPI’s and overdue parking fines to start our own little orchard in a countryside paradise. So what’s stopping us? Apart from the fact that we all really, really love our jobs (take note, Gorilla! ), we realize that the whole farming thing isn’t all beautiful sunsets and fresh produce. After working in a vineyard for five years, I can tell you that growing stuff from nothing is one of the hardest gigs going. Give me content marketing any day. The weather only threatens the comfort of our morning commute, not our entire year’s profit (the product perks are so much better at a vineyard though). The vast majority of us know that we don’t have the skills, patience, or time to grow our own produce from scratch. We leave it to the experts. If we want a nice, juicy pineapple, we don’t go out into our backyard and plant a seed, then wait a whole chunk of time for it to grow. (I assume pineapples need seeds, my research for this post doesn’t run that deep.) We go down to our grocer and buy one. Geez, most of us can’t even be bothered to go to a produce store. We need the convenience of a monstrous all-in-one supermarket to allow us the pleasure of buying our pineapple at the same place we buy our shampoo, dog food, and pre-packaged Jamie Oliver quinoa. 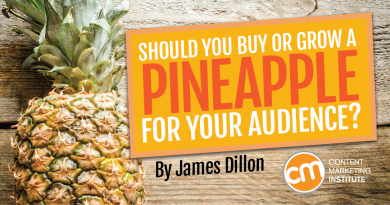 What do pineapples have to do with content marketing? We’re getting there, I promise. The lesson is about to sprout in all its nourishing glory. Just recently, Airbnb went to the trouble. It grew a pineapple. Airbnb is the latest in an impressive line of brands turning to print content marketing. The likes of Net-a-Porter, TD Ameritrade, Four Seasons, and Red Bull have made successful high-profile entries into print publishing. These brands have established internal media companies to develop an audience of subscribers who share the beliefs and lifestyle of their brand. Instead of monetizing this audience by selling display advertising, these brands sell their products and services. All of these companies are growing pineapples for their audiences. They are the farmers of the content marketing world. And you have to admire their guts. Just imagine the time, money, and heartache involved in developing an audience from scratch. It almost rivals the blood, sweat, and tears that have been shed by the farmers of our nations. Through the droughts of subscribers and the floods of furious internal demand for instant ROI, these brands are taking on the dream of creating something from nothing. Carefully crafted content marketing strategies sow the seeds. Internal processes are nurtured to cultivate a high-functioning publishing orchard to rival those of the expert media growers who have been ploughing their fields of audience for decades. The move to sustainable, healthy content marketing from the mass-produced norm of interruptive, promotional advertising could be the savior of the marketing industry. But like organic, biodynamic, paddock-to-plate food production, making healthy content marketing happen is really, really hard. Imagine your CEO walking out tomorrow to start a pineapple orchard in the far north of Australia. That’s probably what it would feel like for a marketer like you or me to launch a print magazine tomorrow. Thankfully, Airbnb is more green thumb than greenhorn. Otherwise, its Pineapple might have ended up in the same trash can as the likes of Verizon’s now infamous SugarString content play. So you see, Airbnb isn’t really starting its magazine from scratch. The seeds have been sown. 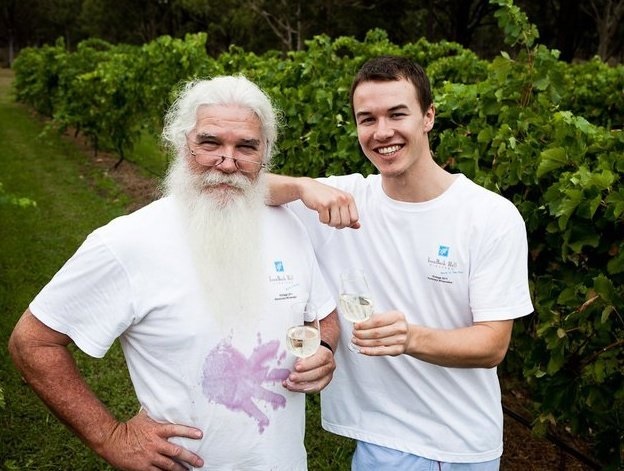 The audience has been fed, watered, cuddled, and harvested with expert care and attention for many vintages. It’s not as hard to grow a pineapple when you already have the whole farming thing sorted. You have the skills, the processes, the structures, and the talent – you’re just adding a new crop and only require the subject-matter knowledge to understand its nuances. A couple of years ago, we mapped out the user journey of the experience of Airbnb hosts, guests, and travellers … it was a natural transition to tell stories in a printed format. We see the magazine living in people’s homes on their coffee table. Apart from this prep time, Airbnb has one of the (if not the No. 1) best content marketing professionals in the corporate world. Chief Marketing Officer Jonathan Mildenhall is the one who moved Coca-Cola’s competitive advantage from “creative excellence” to “content excellence.” His brainchild, Coca-Cola Content 2020, was “quite simply, a manifesto … in how content is going to reshape the strategic marketing process,” according to CMI Chief Strategist Robert Rose. All this content marketing brown-nosing is sufficed to say – Airbnb knows storytelling. Airbnb didn’t grow Pineapple from scratch, it had been learning for years how to create content to bear the fruits of its own labor. But if your brand wants its own Pineapple, you might think about bypassing the whole grow-your-own bit. If you go to the store, it can be much quicker and easier. It might end up being cheaper and more successful too, especially if you’re an amateur. You see, a swath of media and publishing companies already are out there doing it and as traditional magazine ad revenues decline, they are finding it harder to make money. Yet, the skills, processes, and structures of these established audience-building veterans are far superior to the majority of marketers. We brands have the opposite problem. We are not as well-versed in building our own audiences with helpful content, but we don’t want to keep paying others to rent their audience with interruptive advertising. Why not go out and buy the pineapple? We have the money and business model to make an audience profitable. Media companies have the storytelling capabilities and structures that could take us brands multiple years, millions of dollars, and buckets of executive-level gutsiness to develop. Isn’t it a match made in heaven? Editorial independence will be threatened. Key staff members may become disillusioned and leave. The existing audience could be disappointed in the perceived “sell-out” of the publication. Are the dangers of buying an audience insurmountable? No, and I’ll go step-by-step later to explain why these three challenges aren’t all that problematic. There have been too few examples of brands successfully investing in a publisher’s audience, but the likes of L’Oréal, Adorama, and Johnson & Johnson prove it can be done. Sure, some concerns are legitimate, but if a brand is serious (and strategic) about a sustainable content marketing program designed to help and entertain its audience, a media-outlet acquisition can work. Media brands already know a print magazine publication is not designed to sell or promote products. The content’s objective should be to establish authority, build trust, and grow a targeted subscriber base in a niche. Sure, the end goal of the content marketing program should include an increase in sales, but the magazine itself is not the vehicle to make this happen. The best part? You don’t need hundreds of thousands of subscribers for success. We brands don’t rely on ad revenue (though we could snag some if we decided to dabble). We sell goods and services to make our profits. So you might only have 200 subscribers, but if they happen to become furiously loyal, unpaid brand ambassadors that regularly buy your stuff, they are more than worth your while. Aren’t there existing publications with similar editorial missions? Aren’t there existing audiences interested in exploring the same topics as Pineapple and aren’t there readers who believe in those same fundamental values? If Airbnb had bought Lonely Planet, Monocle magazine, or even a smaller travel magazine, couldn’t it have achieved those same objectives? Let’s address those three common concerns of the audience-buying naysayers. Would editorial independence be weaker or stronger? According to the Airbnb content mission, the skilled storytellers at these media companies would be able to get on with the business of telling great stories about the same stuff. They likely would have a bigger budget to accomplish that because that little problem of an advertising-supported publication is gone. The publisher’s sales and editorial teams no longer need to squabble over questionable native advertising requests or the damage any particular story may do to a partner relationship. Would the staff really vanish in a simmering rage? With a content mission like this, an existing masthead’s stories could be just as good (or even better) than before the brand’s investment. Why would an editorial team be upset? There’s no reason why it cannot continue its existing practices without a bunch of salespeople marking up its final drafts. Sure, Airbnb might like to introduce more specific stories about its community, but the editorial mission would remain unchanged. With some clear communication and change management, a mass staff walkout would seem unlikely. Would the audience drop off in an anti-commercial media protest? We content marketers contend that our audiences don’t really pay attention to who crafts the content, they just care about how good the content is. Many media traditionalists may ardently oppose brand-owned media, but a growing number of publishing professionals have a more judicious perspective. “Why spend €40,000 a page to advertise in Vogue when, for the same amount of money, you can publish an entire magazine?” asks Alice Litscher, a fashion communication professor at the Institut Français de la Mode in Paris, in The New York Times. Why spend all the time, money, and heartache to build something from nothing for your brand when you can buy the established audience and storytelling capabilities of an existing publisher in our niche? Growing a pineapple is really hard. You could just go to the store and buy one. Think about it. Have you considered buying an established publisher in your niche? Maybe it’s a small blog or a popular email newsletter – please share in the comments. Or if you think I’ve got this one monstrously wrong, tell me why. Want to learn how to grow or buy your own Pineapple? Check out the CMWorld 2014 sessions available through our Video on Demand portal and make plans today to attend Content Marketing World 2015.